It works like this: a local nonprofit, community group, or business applies to host a Conversation Project program on a topic relevant to their community. 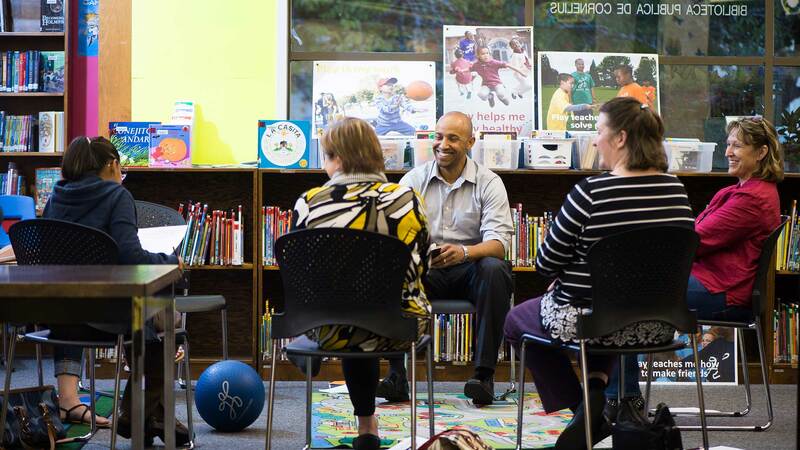 An Oregon Humanities facilitator comes to that community to lead the conversation, which typically lasts an hour and a half. The Conversation Project has almost sixty topics to choose from, including race, place, freedom, sports, climate change, and many others. Our facilitators are trained to connect their topic to the local community and to challenge participants to think in new ways. Our goal is to connect people to ideas and to each other, not to push an agenda or arrive at consensus. We believe that conversation is a powerful medium to invite diverse perspectives, explore challenging questions, and strive for just communities. Interested? Take a look at the program descriptions in the catalog, then read “How to Host a Conversation Project Event,” and complete the online host application. To find upcoming conversation programs in your area, visit our online calendar. If you’re interested in hearing about opportunities to be a Conversation Project facilitator, sign up to receive our enewsletter. We’ll send information about upcoming events and opportunities, including Conversation Project, once a month. Questions? Contact Mikaela Schey at m.schey@oregonhumanities.org or (503) 241-0543, ext.110. The Conversation Project is made possible thanks to the support of the National Endowment for the Humanities, the Oregon Cultural Trust, the Kinsman Foundation, the Roundhouse Foundation, the Emily Georges Gottfried Fund of the Oregon Jewish Community Foundation, NW Natural, and The Standard.